A romantic restaurant with fine service and Continental-seafood cuisine. 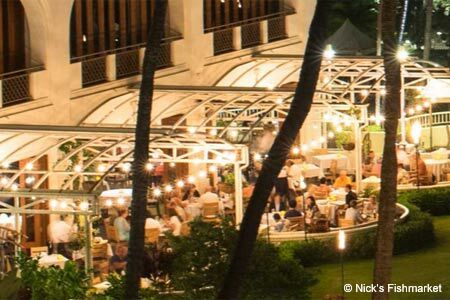 : At Nick's Fishmarket Maui, you can eat outdoors under a trellis amid the palm trees. The sun sets over the Pacific, the place setting sparkles. The cuisine is officially seafood, but essentially this is an old-fashioned Continental restaurant --- crab crêpes with sake-mustard butter, fish in lemon butter and capers, lobster with drawn butter, steaks and chops. The service is so good it seems almost psychic. Our favorite course is dessert --- bananas Foster, sautéed with brown sugar to create a rich caramel sauce, served with vanilla gelato and a toasted coconut pound cake. Another good bet is the strawberries Panzini, a dozen or so strawberries, from Ulupalakua Ranch, served on a lattice work of chocolate and caramel sauces, then flambéed tableside with a mixture of rum, brandy and Grand Marnier. You eat them with Devonshire cream, brown sugar and chocolate sauce, the last of which is swirled and painted on to your plate tableside. If you're looking for a romantic restaurant on Maui, this is probably it.